To ensure correct work of remote jobs over WAN accelerators, you must provide enough free space for service data on source and target WAN accelerators. When you run a remote job over WAN accelerators, Veeam Backup & Replication analyses data blocks going to target and calculates digests for these data blocks. Digests data is stored on the source WAN accelerator, in the VeeamWAN folder on the disk that you select when you configure the WAN accelerator. For example, if you plan to process 10 VMs whose provisioned size is 2 TB, you must allocate 100 GB of disk space for digest data on the source WAN accelerator. 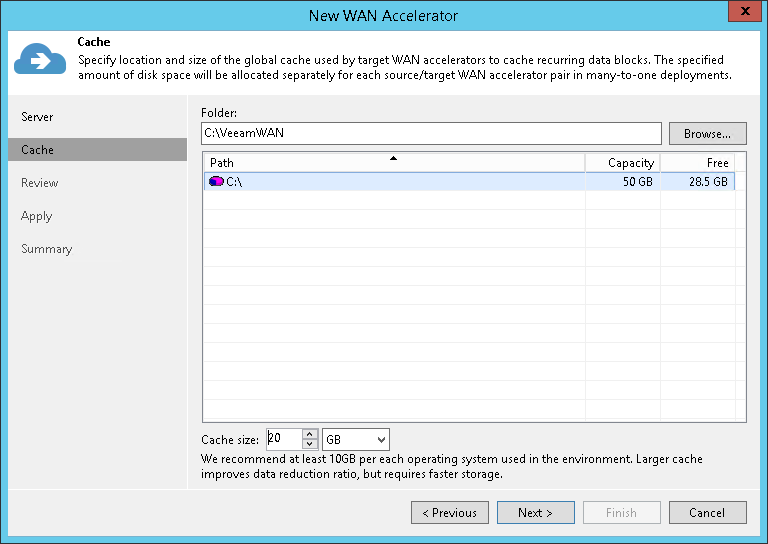 Global cache is stored on the target WAN accelerator, in the VeeamWAN folder on the disk that you select when you configure the WAN accelerator. The size of global cache is specified in the properties of the target WAN accelerator. You must provide enough free space for global cache data. It is recommended that you provide 10 GB per every type of OS on VMs that you plan to process. By default, Veeam Backup & Replication allocates 100 GB for the global cache size. There are 3 types of OSes so you must allocate 30 GB for the global cache on the target WAN accelerator. Global cache is stored only on the target WAN accelerator. You do not have to provide space for global cache on the source WAN accelerator. You have performed the Clear Cache operation on the source WAN accelerator and it no longer contains digest data. For more information, see Clearing Global Cache. Veeam Backup & Replication has attempted to resume operation of backup data transfer but the backup file was not prepared for the operation in a proper way. The digest data must be re-calculated. In such situations, the target WAN accelerator will have to calculate digest data on its own, which will require additional space. This amount of space is required for digest data recalculation. If you do not provide this amount of space and a situation when Veeam Backup & Replication needs to recalculate digest data occurs, the remote job will work in the limited mode. Veeam Backup & Replication will not deduplicate data against the previous restore points copied to target. For more information, see Global Data Deduplication. When you specify the global cache size for a target WAN accelerator, you do not allocate any space for storing digest data. To let Veeam Backup & Replication recalculate digest data, you must make sure that necessary amount of free space is available on the target WAN accelerator (in addition to the space allocated for the global cache). You have allocated 100 GB for global cache on the target WAN accelerator. Provisioned size of VMs to be processed is 2 TB. You have 4 source WAN accelerators in the source side working with 1 target WAN accelerator in the DR site. The global cache size configured in properties of the target WAN accelerator is 100 GB. The size of VMs to be processed is 2 TB. For more information and recommendations on WAN accelerator cache sizing, see the Veeam KB1877 article.